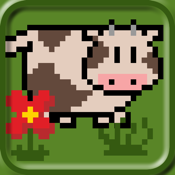 The FREE Pixel Cow game for the iPad and iPhone is here. Play as the Pixel Cow and collect as many coins and fruits as you can to beat the online high score!!! Use the collected coins to buy upgrades to get a better high score.